Sean Pang Wing Sum, Angela Yuen Lai Lam and Jeannie Chan Ying two nights ago attended the film OUR SEVENTEEN (NA YUT NIN, NGOR SUP CHUT)'s premiere. Chan Ying revealed that before the event she had dinner and went to the karaoke box with Stephanie Ho Ngan Sze and Moon Lau Pui Yuet. How as Ho Ngan Sze? Chan Ying said, "I know everyone is concerned about her, but I hope that we don't keep talking about her illness. The most important is she is happy and resting more. Today she looked very happy and in pretty good mood." Did the leads Pang Wing Sum and Yuen Lai Lam have any kiss scene? He said no but she said a little. Yuen Lai Lam explained that because she stole a kiss from him. Pang Wing Sum said, "In other words she tempts me but doesn't give me a chance?" 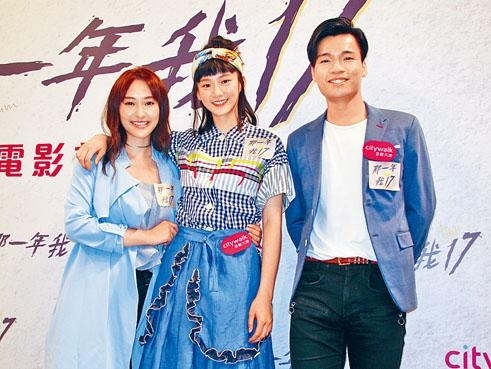 Then they even revealed that when they first met, because he did not have make up and grew facial hair and the 23 year old Yuen Lai Lam dressed very young, he felt like her step father.